Title: London, Can You Wait? Alex loves Mark. Mark loves Alex. But is love enough? 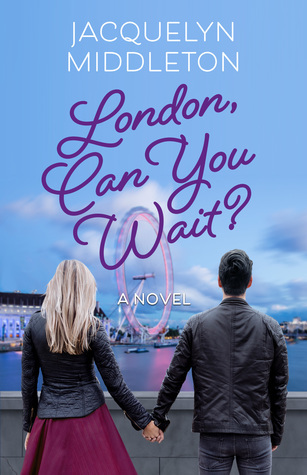 Since moving to London from the US, twenty-four-year-old Alex Sinclair seems to have it all: a coveted job writing for the theatre, supportive friends, and the man of her dreams—gorgeous Irish actor, Mark Keegan. But in the year since the acclaimed debut of her play, Alex and Mark’s lives have been turned upside down. Thanks to his role on a smash-hit British TV show, Mark is catapulted to stardom. Alex couldn’t be happier—until her boyfriend’s popularity and insatiable drive to succeed means they’re apart more than they’re together. Forced to share Mark with showbiz heavy-hitters, intrusive press, and unrelenting fangirls, Alex’s hopes for a stable and committed life with him start to fade. Her struggles with panic attacks, career uncertainty, and Mark’s increasingly worrisome behaviour make her wonder: how much more can she bend before she breaks? A passionate tale of secrets, loss, and ambition, London, Can You Wait? is the eagerly-awaited sequel to Middleton’s debut novel, London Belongs to Me. I was so excited to have the opportunity to read London, Can You Wait. Jacquelyn Middleton has quickly earned her spot on my auto-buy list after reading the second novel in the London Belongs to Me series, and I'm keeping my fingers crossed that she writes another novel soon! I immediately sank my teeth into this novel the second it showed up on my doorstep and I was thrilled to see that so many of the characters I loved from LBTM were also in the second book. Middleton's writing is beautiful and I honestly could go on and on about how much I love it, but when I really sit and think about what it is that makes her writing so great, I just keep going back to the fact that her characters truly feel like my friends. She creates these totally relatable characters that draw you into the story and make you feel the things that they're feeling. I absolutely love that about Middleton's novels and I hope she continues to craft such lovable characters. Without giving anything away, let's talk about the characters and the plot just a little bit. Alex is the same old cute blonde we grew to love in the first novel, but this time she is a little more successful in her career and has earned her place in London. She has grown as an individual and I love how she connects with the other characters. Everything is going great for her... until one day it isn't. Lets just say that Middleton really pulled the rug right out from underneath me about halfway into the novel, and I just didn't think I could go on. I'm talking ugly tears and anger. I'm serious Jax, there were tears, and then anger... all directed towards you! Just kidding, I knew you would redeem yourself in the end. And just like I thought, you wrapped everything up into a neat little bow at the end and my world was complete! As you might have already noticed, I was a huge fan of this novel. Mainly because I really grew to love and adore the characters. The plot is fantastic and fast paced, but the characters truly made the story. I would highly recommend reading both novels in this series! Thank you so much to Jacquelyn Middleton for sharing these wonderful novels with me! I can't wait to read more from you soon!